World music compilations are sometimes a hard nut to crack, especially when you may not have a good reference point from where you can compare the record. While reviewing Pysch Funk Sa-Re-Ga, I would be a liar if I said I had much of a reference point when speaking about Indian funk music from any era, let alone the decade or so leading up to when I was born (the compilation covers early 70’s to early80’s). That doesn’t stop me from loving the hell out of the album, which is as fun and engaging as a world music compilation I have found in a while. 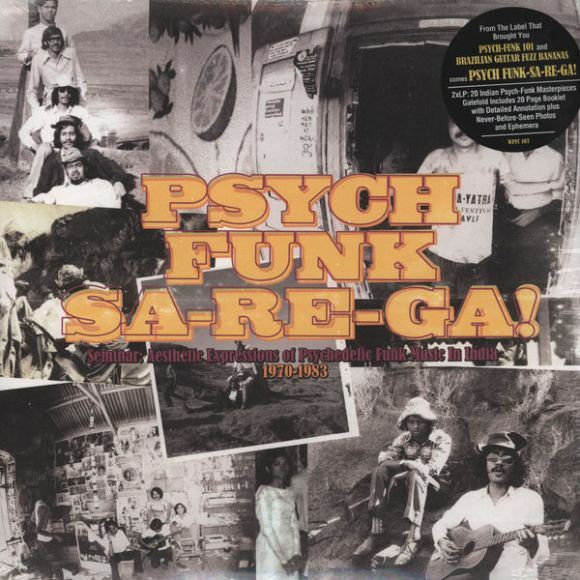 Pysch Funk Sa-Re-Ga is a mix bag as far as styles of music go, with vaguely psychedelic being the only quality that I can find spanning across the whole album. Tracks range from the wobbly, psyched out funk of “Dum Maro Dum (Live)” to “Everybody Dance with Me,” which sounds like a more Bollywood version of Cream. Some tracks, like the suzzy garage rock of “Mary Long” and the swirling garage pop of “The Mod Trade,” sound like they could have been made in San Francisco in the late 60’s and wouldn’t have sounded out of place on the original Nuggets collection. While some of the songs sound like by the numbers garage pysch, there are a few outliers in the form of tracks like the intergalactic synth jam “Hum Tumhe Chate Hain” by Kalyanji Anandji. My favorite find from the record is the “Dhamatra Theme Music,” also by Anandji, which I had first heard covered by the great, underrated Milwaukee band The Chain a while back. Imagine my surprise hearing the source document from a song that I have spun so many times over the last few years. Such is the joy of the great crop of reissues (and particularly the good compilations like this one) that bring so much amazing music to light that I otherwise would have had no idea existed. Like all compilations, I have no idea the breadth and scope that this releases covers and whether or not it is a good representation of the pysch-funk scene in India during this time. That being said, this LP is so enjoyable and jam packed with wildly inventive, loose and fun jams that I can’t really imagine a collection of songs from this region and time being able to significantly top these group of tracks (if there is, please send it my way). Like the other three releases on World Psychedelic Funk Classic imprint (run through the great Stones Throw label), Pysch Funk Sa-Re-Ga is highly recommended and a great place for both newbies to world pysch music and for diehard fans of great music that otherwise might not have been excavated if it wasn’t for the hard work of music nerds in record companies. Look for reviews of the other WPFC releases on Reviler in the very near future.